Bonsai, choosing the best tree for a beginner. Choosing the best tree for a beginner is an important step in bonsai success! As a beginner to bonsai, you have probably been inspired by trees that you have seen in pictures, on television, or in some type of display or demonstration. Certain varieties catch your eye and you decide to rush out and find a tree of that variety and start to bonsai it! Unless you have purchased that tree from a local nursery that has grown that variety themselves and can guarantee it will deal with the local conditions, you may be setting yourself up for failure! Choosing the best variety of tree to begin with can be half the battle of keeping your tree alive and healthy, and make your experience of learning how to bonsai a much more enjoyable one. 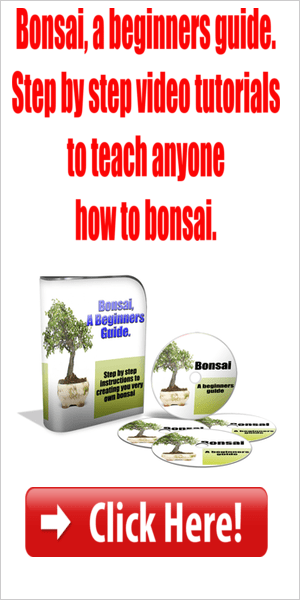 If you have seen the particular variety you are interested in as a bonsai already, then at least you can be confident it is a variety that lends itself to the various elements and training techniques necessary to create a beautiful bonsai. As with all trees, garden variety or bonsai grow better and with greater chance of survival if grown in the right zone for that particular variety. Check with your local nursery or local gardening club to determine the zone you are in, and which varieties grow best in this zone. My tip for anyone who wants the best chance for survival of their tree is choose a variety that flourishes in your local area, trees that grow almost like weeds are good candidates. Where I live figs, bougainvilleas and elms are trees you do not want to grow in the ground unless you have a lot of room and well away from your house. They grow rapidly and are a lot of work to keep trimmed and tidy. 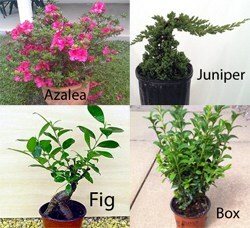 In containers or grown as bonsai they are perfect specimens! Another variety to keep in mind is hedge type trees (Box/ buxus) that respond well to hard pruning as well as ground covers that do well in your area. Junipers and pyracantha both grow as ground cover, but when held up with stakes or other ways until their trunks form can make exceptional bonsai. The main thing is don’t get caught out buying a tree from a nursery that may have been brought in from another area and have little chance of survival or reaching its full potential. If you choose something local, firstly you will have an abundant supply of material to work with as well as the potential to find material that has been growing for a long time and have huge potential as a bonsai. All those grow well here. Thanks for advice.